Marktech is one of a few limited manufacturers who supply emitters in the extended wavelength or SWIR (Short Wavelength Infrared) range. Our standard product offering includes both through-hole and surface mount packages with wavelengths from 1020nm â€“ 1720nm and operating currents ranging from 20mA to 350mA for high power applications. Higher wavelength ranges up to 3000nm are available in specific package types. If something above 3000nm is required which is more in the MWIR (Mid Wavelength Infrared) range, Marktech is happy to work with you to develop a custom wafer / die that meets your specific application. The SWIR wavelength range also requires specialized optical detectors as standard silicon detectors have a maximum sensitivity limit of approximately 1100nm. Marktech produces a line of InGaAs detectors that are optimized for sensing light in the SWIR wavelength range. These detectors can be obtained as an individual discrete component or combined with a silicon sensor to cover the complete spectrum of light from the visible to the SWIR range. Marktech also offers the option to produce multi element devices with emitter and detector chips in the same package. The market for SWIR devices is growing rapidly. They are being used in a variety of applications including produce inspection, security, surveillance, anti-counterfeiting and biomedical to name a few. Marktech’s series of near IR Emitters includes Metal Hermetic Cans, Surface mount, and plastic emitters ranging from 720 to 950 nm. Our IR Emitter series is designed for applications requiring high output and precise optical/mechanical axis alignment. Also included in our emitter series are High Power devices that deliver typical values of 25 and 30 mw @50 mA and can be driven at currents of up to 100mA letting the user obtain output levels of more than 2x that of standard emitters. These devices are available in both 850nm and 950nm. These devices achieve optimal performance for medical sensing, fiber optical communication, optical switching and sensors to name a few. 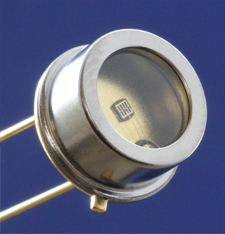 Short wavelength infrared (SWIR) LEDs are the latest addition to Marktech’s broad line of emitters. Available in a variety of through-hole and surface mount packages, SWIR emitters satisfy a growing need for high-speed light emission in ranges not easily seen by standard detectors and are also being used for material and chemical analysis.